February 2012 | It`s full of stars! Java offers many technologies and mechanisms that help developers realize their ideas. One is to save data in a database without dealing with object relative mapping. From the several technologies available to save a Java object into a DB NetWeaver AS Java comes with SAP’s implementation of JPA. For the following blog I’m only looking into NetWeaver >= 7.1 as the code will be using annotations, available since Java 5. The first step to save a Java object is to create the database table. The data stored will be the name and price of a product, as well as a unique id. For this, the Data Dictionary perspective in NWDS is used. A table should have a primary key value and the columns defining the values that can be stored inside the Java object (this can also be done in the reverse way: create first the Java object and then the DB based on the object). Second step is to create the Java object. The values that are going to be stored are mapped to the DB columns. This can be done automatically or by using the @Column annotation. The primary key column is special as the value of this column is normally determined by the application or database automatically without any interference of the user. For this the annotation @ID is used. Here the additional constraint of a table generated Id is used. @Table defines the table where the object values will be stored. The @ before the variable id define id as the Id (@Id) for JPA, how to store the id value (@GeneratedValue) and the actual value that will be used (@TableGenerator). The database table needs to exist! In case the table isn’t specified, the default table TMP_SEQUENCE will be used. 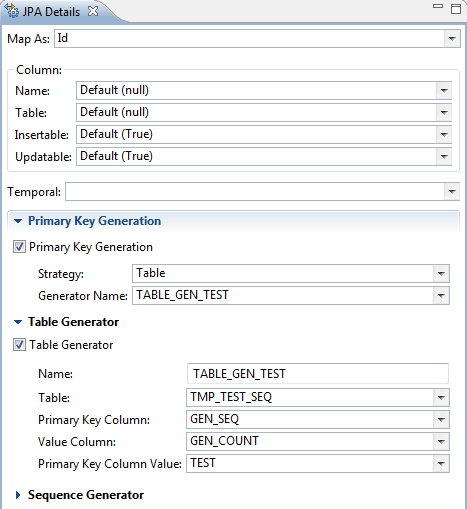 You have to ensure that either the default table or your custom table exists in the DB. Besides that, the table needs to contain specific elements (see the SAP Help link for more details). IDENTITY won’t work with OpenSQL and MS SQL server and IBM DB2. Name: defines the name of this table generator. Used by the @GeneratedValue part. valueColumnName: the name of the column where to look up the value. When the value found there is 56721 the value will be incremented by 1, thus the id will be 56722.
pkColumnName: name of the primary column of the table defined by table (TMP_TEST_SEQ). That value can be the name of the Java class or something else. The entity manager is using the persistence unit name to find out the data source. The data source is defined in the NWA of the AS Java and contains the information how to connect to the DB. The persistence unit gets defined in the EJB project. Java objects that are persisted normally are beans, so it makes sense to wrap the class in an EJB. TestBean is the Bean, while TestLocal is the local interface for lookups. The actual business logic has to be implemented in the Bean, while adding the method to the local interface will make it public. Hint: Using beans allows you to expose your business logic as a JSON object (with Apache Jersey). As beans can also be exposed remotely the Jersey server can run on another server. Developing for NetWeaver AS Java means that you have to use the NetWeaver Developer Studio. The recommendation is to have for every NW release the corresponding NWDS version installed on your computer. When you have to take care of developments running on 7.0, 7.1 and 7.2 you end up having 3 NWDS versions installed. NWDS for NetWeaver 7.0 can be downloaded at SCN. Until recently this was also true for CE. Hope that the CE 7.2 download comes back as it included a NWDS for CE 7.2. For installing NWDS for CE 7.1 you have to download the installer from SAP. The preferences show that nothing SAP related is available. That’s where the downloaded SAP features are. This installation path makes it complicated to use NWDS when the administrator of your company installed the features: your user does not have access to the folder. Copying them from there to the eclipse directory to make Eclipse aware of them won’t work. 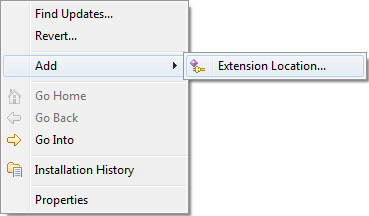 Inside the above directory is a file called .eclipseextension. That’s the only hint you get from SAP, but it’s enough to identify it as an extension directory. Copy that directory to another location (e.g. : E:\CE). From there the SAP features can be installed. The manage configuration dialog (Help -> Software Updates lists the features available. 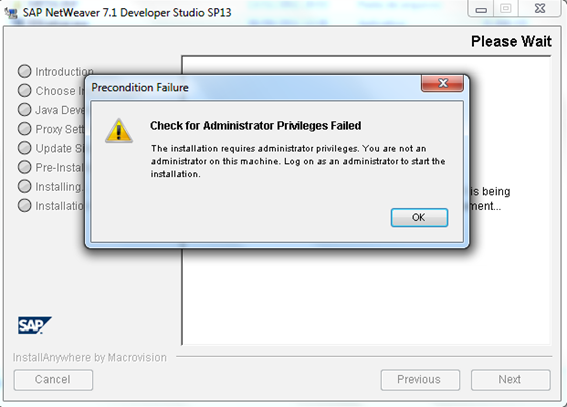 Edit the configuration file SapNetweaverDeveloperStudio.ini. What do you get after all that work? A NWDS for CE 7.1 that can be copied between computers. Conclusion: that’s a little bit complicated considering the NWDS is Eclipse with features installed from SAP.